One of the big debates with bio fuels is over the disruption to world food supply and the competition for product in the demanding fuel and food markets. The example of corn in regards to ethanol is echoed from critic to critic. 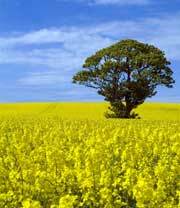 For bio-diesel the past crops of choice were going to be food crops. Sunflower, Soy, Canola, and others produce a nice clean oil yield with lots of trans fatty acids that are crucial for the production of quality bio diesel. Learning lessons, from the ethanol/corn relationship, many in the bio diesel industry prefer not utilize stock that can be a food commodity. Removing food from the list of potential crops can be a quite limiting factor. Few acceptable crops are left and suitable for growing in Florida conditions. One crop that would likely not have to endure political battles and special permitting is Camelina. It is also one crop of a handful that has any scientific study or test plot data to examine. Aside from food seed stock, Kenaf, or Jatropha – Camelina is the only crop that may be able to produce a enough oil per acre to be a viable fuel crop in the state of Florida. The most promising numbers to date are from comparisons made to Canola by Dr. Wright. Dr. David Wright is a professor and researcher at the University of Florida’s Research and Education Center in Quincy Florida. He is IAFS’s expert on Camelina and its potential as a fuel crop in Florida. He offered information about both crops at a recent outreach programmed hosted in Bunnell. Because of the similar requirements and characteristics of the two seed crops, Wright offered a glimpse at what might be. Stressing that the Camelina numbers are from only one year of study and the fact that the two plants are ultimately different, Wright demonstrated the potential for Camelina and its viability as a fuel crop here in Florida. It is cold tolerant allowing planting all the way up to the first week of December. It is more resistant to insects and disease than some other crops. It has the potential in some parts of Florida for two crops annually. It may produce around 30% oil upon crushing and has similar if not better characteristics for fuel production as Canola. Given the fact that Jatropha and Kenaf are not ideally suited for most of Florida, other possibilities are politically challenging for legal, security, or containment reasons; Camelina may be the best possibility for growing a lasting fuel seed stock crop for Florida and its regional neighbors. The TCAA (Tri County Agricultural Area) is an area just North of Daytona and includes St. Johns, Putnam and Flagler counties. An area that has been traditionally rural and reliant on the paper and agricultural industries, TCAA organized with the local extension of the University of Florida’s IFAS program to present information on how the local communities may want to utilize some of its local talents and resources. The program consisted of three tracks and packed a day full of information for anyone that wanted to attend. An overview of bio fuels and the basics of how they are made started the day. Ethanol, biomass, and bio diesel were all covered as potential enterprise. Given the local expertise and crops the day funneled into two basic focuses. The first was bio mass and the several ways to convert wood and fiber into a synthetic gas (not liquid) or biodiesel products. The technology is there according to our universities. The process is readily definable and replicated. The processes are advanced in their efficiency on an ongoing basis. What it comes down to is stock and logistics. How do you collect or create enough base stock to make a viable commercial enterprise? What methods work the best? What crops yield the most? How do you get those materials to the first step of your process? Camelina, this moment’s best opportunity for Florida biodiesel, is about the size of grass seed. Pine trees are a preferred stock for biomass to energy conversion. There are a dozen other opportunities in between trees and seeds for several different accepted methods of converting plant materials to fuel. The University of Auburn did quality presentations on bio mass conversion and bio diesel. There were several examples of food oils that have been used for bio diesel. Soy, canola, cotton seed, and sunflower are all good oils to make bio diesel. However, many people including Green Oil Solutions would prefer not to utilize food stocks so as to avoid the pitfalls that have occurred with corn and ethanol. We have discovered a few possibilities of plants that are not food that may be able to produce the right amount of yields to become stock oil. As mentioned before Camelina is an opportunity. Dr. Wright with UF’s IAFS shared some of his research comparing Camelina to Canola. The research showed strong possibilities but as he noted only has one year of data. We will need more research to know if it can be a viable solution for providing stock for biodiesel. The other crops that are getting mentioned are Jatropha and Kenaf both of which do not appear as suited for growing in Florida as Camelina. Other crops were rumored throughout the day but they are considered nuisance plants and pose political problems before their cultivation challenges can be discovered. The day saw well over 75 in attendance, including students, elected officials, civil servants, farmers, and businesses and did what it was designed to do. Information/education and public inclusion are absolutely essential to building sustainable enterprise in the bio fuels industries. Green Oil Solutions thanks the Florida Energy Systems Consortium, UF’s IFAS for providing the public outreach. Green Oil Solutions, Inc. is dedicated to finding viable opportunities to stock the emerging bio diesel industry. The bio diesel industry, especially in Florida, will not be a viable economic component until initial stock oil is secured in long term positions. Stock can be supplied from a number of sources that include imported virgin oil, domestic feed stock oil, used vegetable oil, tallow, and other base products. Green Oil Solutions is concentrating on what will work best for Florida. Used Vegetable Oil will always be a portion of what is utilized to make bio fuels and there are a number of companies in Florida that are currently or refining or will be shortly. Unfortunately, much of this recycled material does not make it to the bio diesel producers. Much of it sold to foreign markets. Some goes to crop protection as a natural pesticide. A portion is sold outside of Florida and a small amount makes into the hands of the few producers located in the state. As a result most if not all “producers” have had oil collection programs in place for some time. UVO is an important component and one that will be discussed from time to time on this site. Imports are something that Green Oil Solutions reserves for the last resort for a number of reasons, not the least of which is our commitment to grow local economies. There are, however, occasions that provide positive opportunities for working with importers. The long term vision for Green Oil Solutions is to find viable crop opportunities. We will concentrate on crops that are non-human food crops and produce high amounts of oil. One of the goals of this site will be explore different opportunities and sources for oils that can be converted into bio-diesel. There are a handful of crops that are being experimented with currently in the State of Florida. We hope to discover more crops and other natural oil possibilities. By doing so we will revitalize the agricultural industry while building new industries. Green Oil Solutions would like to invite you to join the discussion and be a part of the solution to finding viable alternatives to foreign and fossil fuels. Subscribe to our feeds, submit articles for inclusion, comment on articles, or just visit us once and while for the latest on what is available in the State of Florida to help grow the bio fuels industry.